Since the economic downturn, which led to a sharp decrease in demand across the globe, the metals and mining industry has started traversing a path to recovery with a strong growth foreseen for numerous consumption points across various sectors. Developing economies, especially China and India, are expected play a significant role in this future growth and, continuing the past trends, the iron and steel sector will most probably pick the largest share of the pie owing to mega infrastructure investments planned across nations worldwide. The outlook is also upbeat for other major metals, especially the ones associated with infrastructure development, like zinc and aluminium as well. Gold and copper have also stayed strong in the market despite slumping sales and with economic recovery in close sight, the industry is quite optimistic. But in spite of these encouraging signals, there are certain challenges which continue to affect the industry making it more volatile than ever. The sector is being largely influenced by risks like resource nationalism (though which local governments are seeking a greater take from the sector beyond taxation), acute skills shortage with new project areas like Mozambique, Mongolia, Indonesia etc. being largely hit, growing social concerns over mining and climate change, making it harder for miners to operate effectively while satisfying the increased expectations from various stakeholders. There are also issues related to increasing cost inflation as well as price and currency volatility which are adding to the woes of the mining companies. 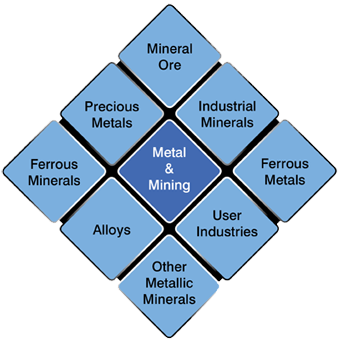 Under such a market scenario, maintaining optimum levels of cost effectiveness and operational efficiency while expanding production is expected to be the key to long term sustainability for the global metals and mining industry thus requiring strategic decision making assisted through relevant market data and analytics. Infraline Energy's Metals and Mining Practice combines Infraline's energy and metals expertise thereby developing a holistic approach scanning across the entire value chain to provide our clients with the best in class consulting services. Our team of expert advisors have assisted a variety of organizations in strategic decision making including one of the world’s largest metals and minerals trader. We service a variety of clients in the Iron & Steel, Non Ferrous Metals and Mining industries ranging from major producers to prominent traders providing advisory services on all the techno economic and commercial aspects of the industry. Benchmarking of Indian Iron Ore with Global Iron Ore bearing nations. Periodic Price forecasting of Indian Iron Ore, by grades. Market Research study on Iron Ore Miners in India. Opportunity Assessment for pellet making in the Indian market. Comparative analysis of Regulatory, Legal & Taxation Scenario of Iron Ore producing nations. Insights into the emerging African Iron Ore industry. Global mine profiling for top Coal producing nations. Benchmarking Indian Coal vis-a-vis other top producing nations, globally. Pros and Cons of acquisition of Coal assets overseas, for specific nations. Critical analysis into emerging Coal sourcing destinations, such as Mozambique & Colombia. 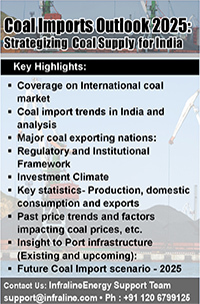 Market study on demand for Indian steam Coal till 2017.
nfrastructure gap analysis for Indian Coal transportation logistics. Mapping of captive and non-captive coal mines in India (statistics on mine-wise stripping ratios, operational status and production statistics). Bauxite exploration and mining outlook in India till 2020. Aluminum & Metal Scrap global Import/Export dynamics. Aluminum Fabrication Industry in China. Primary research study on Zinc reprocessing and recycling industry in India. End use industry consumption analysis for Zinc in India till 2020. Impact analysis of Chinese demand fluctuations on Indian Zinc industry. Market study and demand assessment for Galvanizing Industry in India. Comparative framework for development of Indian Zinc industry, along global lines. Price Volatility in International Lead Trade. Market sizing of Indian Lead acid battery sector. Primary research study on the evolving Lead recycling industry in India. 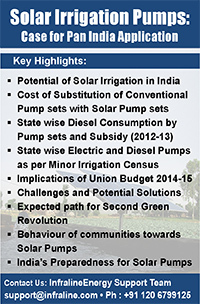 Gap analysis for lead demand supply in India till 2020. Best Global sourcing options for Indian Lead Consumers. Study on Lead scrap disposal in India. Structure of Nickel industry ownership, globally. Global Nickel Asset mapping for evaluating sourcing options for Indian demand centres. Porter's Five Forces model for Indian nickel industry. Medium Term Nickel demand forecasting for Indian steel industry. Study on Nickel Pig Iron Industry in China. Domestic Steel Prices Forecast, by Long and Flat Products. China and its requirement of Steel raw materials till 2020. Prospects of Finex, Midrex and Corex technologies in the Indian Scenario. Study on Competition in Indian Steel Industry. Demand for Automotive Steel in the Medium Term for India. Study on International Mine Safety Best Practices. International Mining Policies vis-a-vis MMDR Act, 2010. Paucity of railway rakes and tracks in movement of resources. Issues in Mining of Base Metals in India. Strategic business plan, partner search for Contract Mining and assistance in negotiations. Mining equipment market Outlook till 2020 in India. Infrastructure spending and demand assessment for Cement in India. Competitive landscape for the companies thriving in Indian cement market. Global assessment of M&A activity across the cement industry. Roadblocks in Cement Capacity Augmentation in India. Impact of Cartelisation in the Cement sector in India. In-depth Industry and market analysis forecasting global fertilizer supply and trade. Impact of Fertilzer subsidy removal on Indian farmers. Assessing global trade and pricing of phosphates including DAP, MAP, NPK and Phosphoric Acid. Dependence on import for Potash requirements in India till 2020.